A darkly gripping tale of two girls separated by thirty years but pulled together by the looming house of Thornhill. 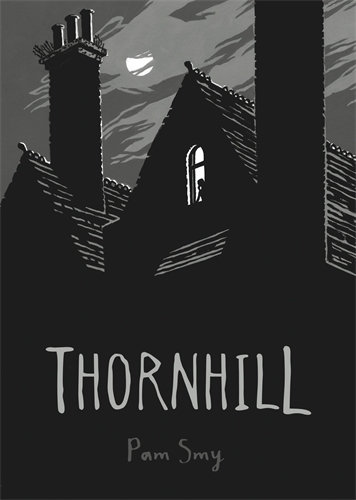 A true chills-down-the-spine ghost story that is equal parts Edgar Allan Poe, Charlotte Bronte, Alfred Hitchcock and Joan Aiken, Thornhill is a completely absorbing mystery that taps into childhood loneliness and the search for identity, with a healthy dose of heart-stopping dread thrown in for good measure. As she unpacks in her new bedroom, Ella is irresistibly drawn to the big old house that she can see out of her window. Surrounded by overgrown gardens, barbed wire fences and 'keep out' signs, it looks derelict. But that night, a light goes on in one of the windows. And the next day she sees a girl in the grounds. Ella is hooked. The house has a story to tell. She is sure of it. Enter Thornhill, Institute for Children, and discover the dark secrets that lie within. But once inside, will you ever leave? Told partly through historic journal entries and partly through beautifully detailed, wordless sepia illustrations, this is an unforgettable story from a striking new talent. British illustrator and author Pam Smy studied illustration at Cambridge School of Art where she still lectures part-time. Her work as an illustrator includes artwork for Julia Donaldson and an edition of The Hound of the Baskervilles as well as, more recently, Linda Newberry's The Brokenspectre. Thornhill is her first book as author and illustrator.